When my friend Kelsey showed up to have a lady party with Stark Raving Malbec by Rosenblum Cellars and Fancy Pants Red Wine I was thrilled. “That’s exactly why I bought it. I loved the label. I knew you’d get it!”she giggled. Her husband Tim rolled his eyes. “I know.” This is why I love her. We clinked our glasses together after oohing and ahhing over the labels for at least fifteen minutes. While Tim delighted us for the next ten minutes with a story of a fascinating conversation about Comic Con with a bodybuilder he met at the gym. At the end of it he still couldn’t tell if he spoke to a man or a woman. Stark Raving Malbec from Argentina was developed by winemaker John Kane (part of Rosenblum Cellars). These wines are made to gulped or slurped, meant to be simple to drink like grabbing a beer. It was easy enough for us to slurp since Stark Raving Malbec has a screw top. Sometimes I get nervous around screw top wine bottles because I’m afraid that the wine will taste like five-dollar gas station wine or gasoline. But life is tough for us on a weeknight while trying to put small unruly children to bed at seven o’clock, so we gave it a go. The label says that this Malbec wine tastes like berries and smoky bacon. Well I didn’t detect any bacon, but I did taste the berries particularly blueberries and black cherries. I did pick out a toast flavor, maybe that’s because I like bread. It also has a hint of thyme to it. 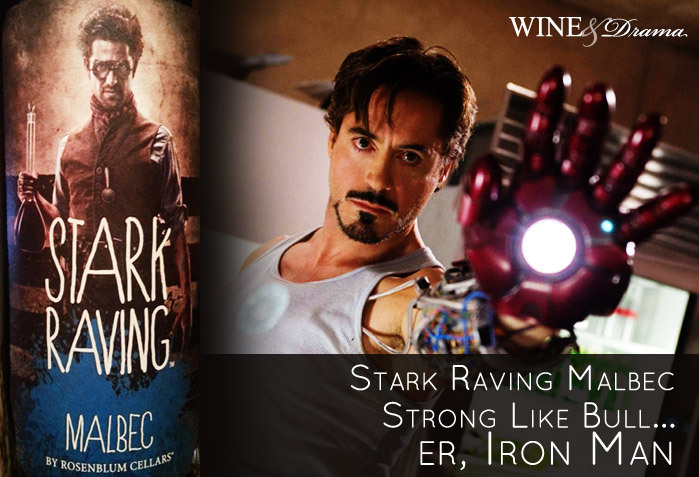 Stark Raving Malbec is a rich, smooth wine with a strong tannic structure but it doesn’t overwhelm the wine with leather notes. It’s also aged in new French oak barrels for 15 months; a really nice touch that gives it beautiful depth. Strong, juicy, and flavorful – at around $11 it’s perfect with steak, bacon, or a pizza. Iron Man would drink it and it’s definitely Wine & Drama approved.